The Omni-PureTM Genomic DNA purification system is designed for a convenient volume of 300 µl whole blood (lower volumes can also be used) to yield an average of ~10 µg ultra pure DNA. This quantity is sufficient for restriction-based Southern blot analysis and hundreds of PCR-based analyses. The Omni-PureTM Genomic DNA purification system is designed for convenience and consistency. It is a universal genomic DNA purification system. Ultra pure genomic DNA can be purified from small amounts of almost all known sample types and sources. Samples from human blood, bodily fluids, animal and plant tissue and microbial and viral sources have been purified using the Omni- PureTM Genomic DNA purification system. One purification is usually sufficient to yield enough DNA for all molecular biology applications. Purified genomic DNA (~200 ng) was electrophoresed on a 0.8% agarose gel and stained with ethidium bromide. Observe high quality genomic DNA that ranges from ~30 to 50 kb in size. Lane M contains molecular weight markers from 10 kb to 50 bp in length. Lanes 1-4 are genomic DNA samples obtained from blood samples of 4 different individuals using the Omni-PureTM system. Each purification sample volume is specially geared towards the desired downstream application. A sample volume of 300 µl is recommended for human blood samples yielding on average from 5�15 µg of high molecular weight and high quality genomic DNA for two restriction digestions for Southern blot analysis. The yield is sufficient for hundreds of PCR amplification reactions. An accompanying product manual contains a detailed protocol for the extraction of genomic DNA from tissues and bodily fluids. Human blood genomic DNA from different individuals purified using the Omni-Pure� Genomic DNA Purification System. 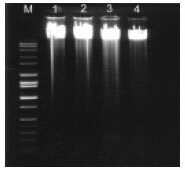 Approximately 5 �g were digested with different restriction enzymes and the samples were electrophoresed on a 0.7% agarose gel. Note the high molecular weight DNA and the consistency between different samples. The gel was processed for Southern blot analysis and chemiluminescent detection. Click here for pricing and to order! Samples from various animals were processed for DNA purification using the Omni-PureTM Genomic DNA Purification System. 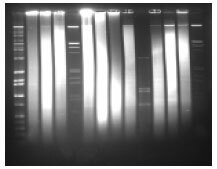 Purified genomic DNA (~200 ng) was electrophoresed on a 0.7% agarose gel and stained with ethidium bromide. Observe high quality genomic DNA that ranges from ~30 to 50 kb in size. Lane 1 contains molecular weight markers followed by samples from human, rabbit, cat, mouse, guinea pig, sheep, pig and hamster.